Artist Kathryn Weisberg is the kind of woman who, while having a conversation about all the interesting things she’s done in her life, forgets to mention that she lived in the wilderness by choice for six months at the age of 24 until a half an hour into the interview. It is safe to say that in a life chock full of world travel and occupations ranging from computer technology—where she managed the team of “geniuses” who invented scalable font—to diving tour guide—where she led Florida tourists on underwater treks to see sharks—it might be easy to omit a stint in the woods with nothing but a small book on edible plants and a Swiss Army knife. This, more than any story Weisberg could tell about her life, exemplifies just how many stories there are to choose from. 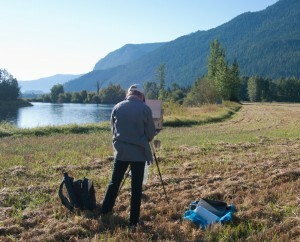 Kathryn Weisberg painting al fresca in Clark Fork. Courtesy photo. Still, despite her undeniable flexibility of occupation, one thing about Weisberg has never changed. Above all, she is an artist — something she’s known since age 10. “There were a lot of artists in my family — a lot of musicians, dancers, artists. It wasn’t really something I decided, it was just something I couldn’t get away from. It wouldn’t leave me,” she said. Weisberg was chosen as the 2016 poster artist for the Festival at Sandpoint. As far as her style goes, Weisberg said she spent the first 25 years of her art career attempting to depict the souls of wildlife with her paintbrush, but she now dabbles in impressionistic works. This year’s poster, unveiled last Thursday, depicts a cello in the sand of Lake Pend Oreille’s shore beside a pair of sandals. In the background, the blues and greens of the lake meet a pale blue sky graced by fluffy white clouds. Weisberg said the inspiration for her rendition of the festival poster came to her as she lay in bed back in January. Weisberg went on describe the specifics of this sensation — right down to the sand in her toes, the cool breeze, the warm sun, the chiseled mountains that surround the lake and the bald eagles flying overhead. She said that this sensation is unique. For her painting, she imagined what it would be like to be a cellist visiting Sandpoint with the Spokane Symphony who had to practice indoors all day prior to their performance. “They want to go to the beach. They don’t want to sit inside all day and practice. So off they go with their cello, kick their flip-flops off, stick the cello in the sand and practice,” Weisberg said. It was her art that led her to Sandpoint in the first place, Weisberg said. After growing up on horseback in the rural outskirts of San Francisco where her parents owned a cattle ranch at the foothills of Mt. Diablo, Weisberg attended the Academy of Art in San Francisco. She then launched into an extensive career in the field of font technology, working for Xerox, NASA, Apple and Adobe. Amidst her high-tech career, Weisberg, who also holds degrees in psychology and business, said she never stopped painting. Since the early 1990s, her work has consistently been shown on an international level. And it cannot be understated: Weisberg has been around the world. Well, except for India, China, Africa and the Middle East — but they’re on the list, she said. So how does a well-traveled Californian artist choose little ol’ North Idaho as her new home? Weisberg said she decided that California was too crowded and it was time to leave, so she set her sails for Sandpoint in 2003. “[North Idaho] seemed like a logical location for someone who paints wildlife and landscapes and wants to be away from a lot of people. And of course the lake was a heck of a draw,” she added. Weisberg is also a signature member of the nonprofit, international organization Artists for Conservation, and has spent much of her travels seeking out and appreciating rare landscapes and animals with her art. She won’t paint anything she hasn’t seen, she said. “Grizzly bears, I go find them in the Arctic. Moose, I go find them in Sandpoint,” she said with a laugh. By her own off-the-cuff tally, Weisberg said she has painted upward of 2,000 works, and has sold nearly 400. She said that she won’t sell a piece if she doesn’t feel good about it. Weisberg said she won’t paint anything dark or depressing. She said she likes people to lighten up when they see her art.